The house is located about 2 km from the historic center of Cutigliano in a quiet and scenic environmment. The new construction since 2004 has attention to detail, both inside and outside, its architecture refers to the ancient Tuscan farmhouses in rustic style. The apartments are bright and spacious and offer all the amenities for a quality vacation. After having been a popular tourist resort for the elite for more than a century, Cutigliano today offers a range of service and facilities that offer various possibilities for living and entertainment: possibility of hiking, horseback riding and mountain bike, to attend the various processes of the cheese and tasting of typical products (chestnuts, honey, jams); and the finest and prestigious restaurants. The city offers the presence of sports facilities such as a football field, tennis courts, gym, basketball court, ice rink, outdoor pool, riding stables, and a multipurpose room for congress tourism. 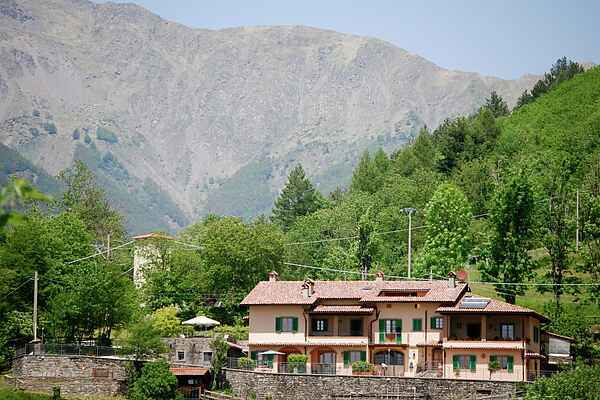 There is also a cable car with cabins for 45 people that has the capacity of connecting the village with the ski slopes Doganaccia and the ridge of the Arcane Cross in only 7 minutes. These ski slopes are also the starting point for many hiking trails. Your pets are more than welcome! However, we kindly ask our guests not to leave them in the apartment all day, especially because they are not used to this place. Certain of your understanding we can not wait to welcome you! Cutigliano, during the last centuries, managed to keep the aristocratic medieval architecture which makes it the jewel of the Pistoiese Mountains. Small stone streets go through bridges and graceful arches that once met noble and captains, artists and rebels. In the historical center we can admire the beautiful Palazzo in which resided the captain of the Mountain who had the task of administering justice on behalf of Pistoia. In the 1300 in fact the various external attacks by neighboring and internal rebellions populations between Panciatichi and Cancellieri necessitated the presence of a figure that maintained the order to the mountain.